This simple 3-step system includes everything necessary to shape and fill the eyebrows, and finish everything off with a beautiful brow highlight. The shades are made with 100% natural minerals which will not irritate the skin or block pores. Shades are light brown, dark brown, black, and a highlight shade. Eyebrows help shape the face and have a dramatic impact on the way that eyes are defined. They have the ability to make our eyes looks smaller or larger, and with mineral powders you are able to fill the brows with colour to enhance overall facial structure. Take your first step to a natural, safe and healthy beauty routine with Bellapierre mineral cosmetics. Offering the full range of mineral makeup and skincare that you dream of, Bellapierre will ensure you look and feel like a goddess. Zinc Stearate, Zinc Oxide (CI 77947), Dimethicone, Tocopheryl Acetate (Vitamin E), Magnesium Stearate, Phenoxyethanol. May contain +/- Titanium Dioxide (CI 77891), Mica (CI 77019), Iron Oxides (CI77491, CI77492, CI77499)]. 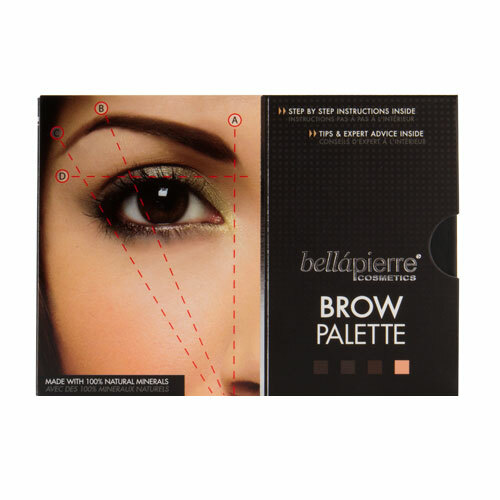 Step by step instructions have been included inside the Bellapierre Brow Palette. Below are reviews of Bellapierre Brow Palette by bodykind customers. If you have tried this product we'd love to hear what you think so please leave a review.